I met Frida a few years ago and got impressed by the simple and stylish clothes that she designs. I think her brand makes clothes that would fit perfectly in any work wardrobe. 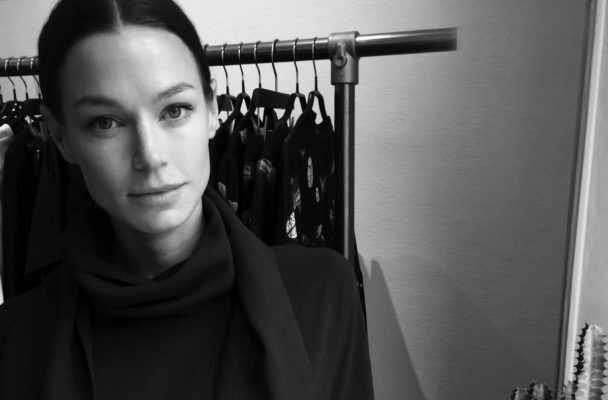 So here are three questions with Frida Ahlvarsson, co-Founder and Head Designer of the Swedish fashion brand Ahlvar. 1. What are the fashion trends for this autumn? Im a bit scared of the word trend to be honest, we work more with what signals a woman want to send based on the clothing she is wearing. We want women to feel powerful in how they dress, that’s my biggest goal. But this fall I’m extra in love with everything that you can swipe around your neck, all sorts of shawl collars. Take an extra look at our Hoshi dress and Alini blouse with this detail. 2. Which three must-have pieces do you recommend for the work wardrobe? Our Hana mermaid skirt from fall/winter 2018 collection is a keeper. You get a feminine silhouette and you can combine this item to anything. Our Yui top, they call it ”the perfect dinner blouse”. With a boat neck and cap sleeve, this little favorite item is automatically giving you a better posture, more confident. Ayumi blouse, this blouse has a waterfall draping at front neck, both feminine and dramatic at the same time and it works perfectly with all bottoms. 3. What do you usually wear at work? Either Im wearing one of our silk skirts together with an oversized t-shirt or Im very often choosing the Kasumi blouse together with high waisted black denim. I don’t have that much time during the mornings so I’m very often looking the same. I prefer it comfortable and uncomplicated :).